Rollins says he feels terrible today. His match with Lesnar was brutal, but he got back up. He took everything Lesnar had, and he got back up. Rollins says he might have used some questionable tactics, but he didn’t do anything Lesnar wouldn’t have done. Rollins says he heard that Lensar and Heyman took a flight to Las Vegas for some meetings, and they can stay there. Rollins is now the champ, and he’s going to be a champ that everyone can be proud of. New Day comes out, and the new WWE Champ, Kofi Kingston, leads Xavier Woods and Big E to the ring. 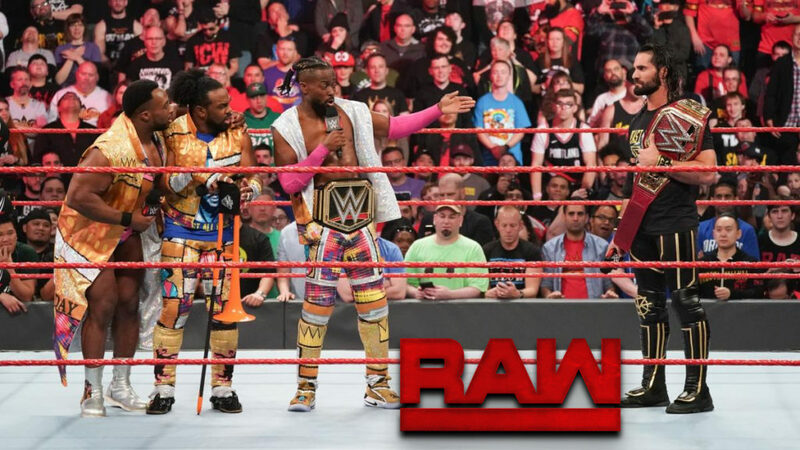 New Day says Wrestlemania was cause for celebration, and they are here on RAW because they just couldn’t wait for Tuesday. Kofi says he was watching the main event last night, and he got an idea. Why don’t the WWE Champ and the Universal Champ have a winner take all match tonight? Seth Rollins accepts Kofi’s challenge. Good match. The energy was extremely high throughout the entire match. All four men were speeding through this match, and that made it feel like it could end at any moment. The match felt chaotic, but in a good way. Both teams felt desperate, like they needed to win. And really, both teams really did kind of need to win. I’m not upset about who won, but I am a little disappointed with who lost. The Revival has struggled mightily in their title reign (and beyond). In the ring, Mike Rome introduces Baron Corbin with a bunch of dumb titles. Corbin comes out and heads to the ring. Baron Corbin gloats about his victory over Kurt Angle last night. He says he is used to having people doubt him, but he loves to prove people wrong. Since he beat Angle, Corbin thinks he deserves a gold medal of his own. Kurt Angle comes out and heads to the ring. Angle tells Corbin that he was the better man last night, and he wishes Baron all the luck in the world in his career. The two men shake hands, and Angle clarifies his statement. He wishes Corbin bad luck. Angle attacks Corbin and puts him in the ankle lock. After a few seconds, Angle releases Corbin. Corbin rolls out of the ring as Angle celebrates. Lars Sullivan arrives on RAW and heads to the ring. Sullivan and Angle stare at each other until Sullivan picks Angle up and slams him. With Angle down, Sullivan climbs the ropes and hits Angle with a diving headbutt. Sullivan smiles as he leaves the ring. This was short, but I liked it. Both women were aggressive tonight. It felt like Bayley had something to prove, and Alexa seemed like she was amped up for having her first singles match in a very long time. The new RAW and SmackDown Women’s Champ, Becky Lynch, heads to the ring. Becky says that Ronda and Charlotte had been doing a lot of talking about their resumes over the last few months, but the woman with nothing left with everything last night. She says that leaving home at fifteen to fight around the world taught her to survive. She will always persist and come out on top. Becky says she knows that as the champ of both shows, everyone will be coming for her. But Becky will be ready, and she will slap down all challengers. As Becky leaves the ring, Lacey Evans walks down to ringside. Lacey and Becky stare at each other, then Lacey punches Becky in the face. A brawl breaks out. Becky and Lacey brawl up the ramp, and Becky goes for Disarm her on the stage. Lacey manages to slide off the side of the stage and escape Becky’s hold. Becky leaves as referees urge her to back off. Charly Caruso asks Seth Rollins why he would accept Kofi’s challenge tonight. Rollins says he lives for challenges like this. Also, Rollins feels a little insulted that a champ from SmackDown would come to RAW and try to take what he has earned. Kofi better bring his A game tonight, because B+ won’t get the job done. Good match. Roode and Gable talked about winning “by any means necessary” in a promo taped earlier, and though they did seem aggressive, they didn’t really do anything too dirty in this match. Roode and Gable did control a decent portion of the match, but Black and Ricochet had a decent amount of offense as well. This was a pretty even match. I liked it. After the match, Bobby Roode attacks Ricochet. Aleister gets into the ring, but Roode grabs Gable and gets out of the ring before Black can retaliate. Elias is upset that John Cena interrupted what was going to be Elias’s greatest performance. But that’s okay. Tonight, the McMahons have given Elias plenty of time to play his rock opera. And if anyone interrupts him tonight, there will be hell to pay. Dean Ambrose heads to the ring for his last match on RAW. Bobby Lashley and Lio Rush come out next. They head to the ring. Rush looks like he has something to say, but he can’t find the words. Lashley takes the mic from Ambrose. Lashley tells Ambrose that he shouldn’t worry, while Ambrose is gone, Lashley will take care of his wife for him. Ambrose attacks Lashley. Ambrose beats up Lashley all around ringside. The fight makes its way up to the stage where Ambrose hits Lashley with Dirty Deeds. Ambrose begins to set the announce table up for something when Lio Rush distracts him. Lashley spears Ambrose and drives him through the announce table with a modified spinebuster. Lashley and Rush leave while Renee Young and some referees check on Ambrose. Sami Zayn walks down a hallway. Mojo Rawley talks to himself in a broken mirror. He wonders why he wasn’t at Wrestlemania. he also has some purple makeup around his right eye. Sami Zayn heads to the ring. He says that though it might be hard to believe, his schedule is wide open. He could really go for a match right now, so he invites someone to come to the ring. The new Intercontinental Champ, Finn Balor, accepts the invitation. Very good match. Zayn was having fun in this match. He was clearly ready to return, and he gave Balor a very entertaining match. They started with some nice grappling early in the match, then they started to create some distance for flying. They were a pretty equal match for each other, and that made this title defense very fun to watch. After the match, Zayn says that he thought coming to RAW would cure what ails him, but all it did was reinforce what he has been thinking about for the past nine months. It genuinely seems like the fans missed him, but Zayn genuinely did not miss any single one of them. Zayn says the WWE is toxic, but it’s not because of the McMahons or anyone in the back. It’s because of the fans. The fans only get joy and satisfaction from being critics. The only thing that gives the fans any sense of importance is to judge other people. It’s hilarious how delusional the fans are. They have become the evil overlords of WWE. Zayn has always done what is right, and the right thing to do is to hold each and every member of the audience accountable every single week. Zayn says he’ll see us in Hell as he leaves the ring. Dana Brooke interrupts Sarah Schreiber to congratulate Becky Lynch on her win at Wrestlemania. Brooke says that she might not be in the front of the line of Becky’s challengers, but she isn’t at the back either. In the ring, Elias talks about Cena interrupting him at Westlemania two years in a row. He says Cena is no musician, and he is just riding the coattails of Elias’s popularity. Tonight, Elias would like to show everyone how pathetically easy it is to rap like Cena. Elias raps (sort of). Elias raps that the next person to interrupt him will be a dead man. The Undertaker heads to the ring. Elias thinks about making a quiet exit, but he stops at the ropes. Elias chooses to stay in the ring with The Undertaker. Elias removes his jacket and faces Undertaker. Undertaker steps towards Elias. Elias runs at The Undertaker, but The Undertaker hits Elias with a big boot. Elias then takes a chokeslam followed by the Tombstone. The lights go out as The Undertaker’s music plays. Good match, but it was cut short by an attack from The Bar. After the match, The Bar continues to attack Kofi Kingston. Seth Rollins enters the ring to help Kofi, so The Bar attacks Rollins. Kofi gets back up, and he and Rollins fight off The Bar. Rollins gets on the mic and says he and Kofi can finish their match another time. Tonight, if Kofi agrees to team with him, Rollins wants to fight The Bar. Everyone agrees, and the match starts. Good match. The crowd checked out for the most part because of the rather cheap way of avoiding a Winner Take All decision, but the match was entertaining regardless. As with all the matches tonight, there was a ton of energy from all the competitors in this tag match. I think The Bar was a good choice to make Rollins and Kingston look great the night after they both had a grueling match. I think the NXT callups from a few weeks ago combined with the fact that the Superstar Shakeup is next week meant that there would be few surprise callups tonight, but seeing Lars Sullivan and Sami Zayn was very cool (especially Zayn). The Undertaker bit was fun too. I enjoyed this show overall, though I wonder why they would promise a Winner Take All match only to take it away. No one really expected for there to be a match like that tonight, so it felt a little cheap giving it to us then taking it back. Regardless, any complaints I might have are nitpicks. The matches tonight were fun. This was a good show. This was definitely the best wrestling match of the night. I’m very glad Sami is back, and I’m excited for Balor to be a (hopefully) dominant champ.